“Although the causal agent of strawberry powdery mildew has long been known by the name Sphaerotheca macularis, it has more recently been reclassified as Podosphaera aphanis. Classification of all powdery mildews before 1980 was largely based upon features of the overwintering structures or fruiting bodies called cleistothecia. In particular, genera of powdery mildews were grouped and named based upon the numbers of spore containing sacs known as asci (singular ascus) in the cleistothecium and the morphology of the appendages of the cleistothecia, in particular the appendage tips. 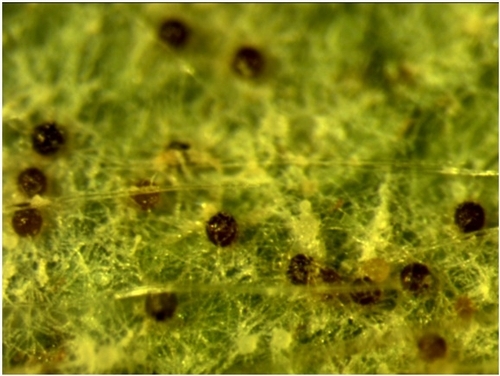 The foregoing system has been largely supplanted by the phylogeny (history of evolutionary relationships) of powdery mildew fungi inferred from internal transcribed spacer (ITS) of ribosomal DNA sequences, which correlates with conidial ontogeny (developmental changes) and morphology (structure) (Braunet al., 2002). Although such details may fascinate taxonomists, the bottom line for those concerned with the practical aspects of disease management is this: the fungus has a new name, but it's the same pathogen, not a new one that has recently attacked strawberries. Although it is the same pathogen, it is important to know the new name as it will eventually be updated in all publications. It is even more important when we look for recent updates as it is very likely to have the new name. 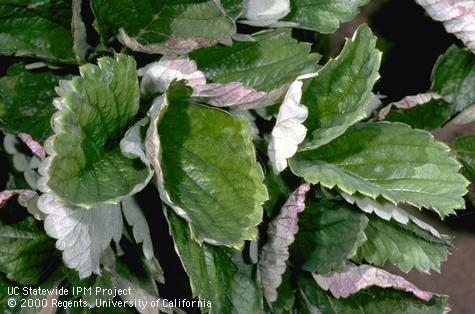 Brief description about the disease and symptoms: Powdery mildew is an important disease causing damage to leaves, flowers, and fruit and affecting the fruit yield and quality. Typical symptoms include white, powdery fungal growth on the lower surface of the leaves, upward curling of the leaf edges, and dry, purplish patches on the upper leaf surface as the disease advances. Dry leaf surfaces, cool to warm temperatures and high humidity favor the infection. Fungal spores are disseminated by wind and cause further infection. Recent studies indicate that cleistothecia serve as functional source of primary inoculum (Gadoury et al., 2010). Resistance of leaves and berries to the infection significantly increases as they mature (Gadoury et al., 2007, Asalf et al., 2009, Carisse and Bouchard, 2010). You can refer to the UC pest management guidelines for additional information. Asalf, B., A. Stensvand, D. M. Gadoury, R. C. Seem, A. Dobson and A. M. Tronsmo. 2009. Ontogenic resistance to powdery mildew in strawberry fruits. Proc. 10th International Epidemiology Workshop. (eds. Gadoury, D.M., R. C. Seem, M. Moyer and W. E. Fry). Cornell University, New York. 177 pp. Braun, U., R.T.A. Cook, A. J. Inman. and H. D. Shin. 2002. The taxonomy of the powdery mildew fungi. In The powder mildews: a comprehensive treatise (eds., Bélanger, R. R., W. R. Bushnell, A. J. Dik and T.L.W. Carver), pp. 13-55. Carisse, O. and J. Bouchard. 2010. 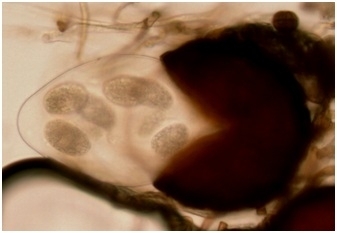 Age-related susceptibility of strawberry leaves and berries to infection by Podosphaera aphanis. Crop Protection 9: 969-978. Gadoury, D. M., B. Asalf, M. C. Heidenreich, M. L. Herrero, M. J. Wlser, R.C. Seem, A. M. Tronsmo and A. Stensvand. 2010. Initiation, development, and survival of cleistothecia of Podosphaera aphanis and their role in the epidemiology of strawberry powdery mildew. Phytopathology 100: 246-251.